Education Program in Reproduction and Development (EPRD) is the postgraduate education section of the Monash University Department of Obstetrics and Gynaecology, School of Clinical Sciences and is based at Monash Medical Centre. The course enjoys a close relationship with, and teaching and research support from, the Prince Henry’s Institute (PHI) and the Centre for Reproduction and Development at Monash Institute of Medical Research (MIMR). 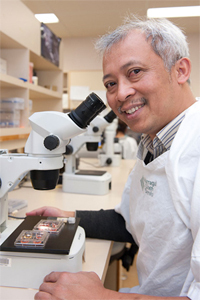 It also receives teaching and other support from many other agencies such as Monash IVF, Melbourne IVF, Family Planning Victoria, Victorian Assisted Reproductive Treatment Authority, and various departments in the Monash Faculty of Medicine, Nursing and Health Sciences (FMN&HS). Since 1987, EPRD has provided postgraduate, public and professional education in the areas of reproduction and development, bioscience and medicine. The program has gained an international reputation for providing thorough training and background for work in reproduction and development. Today, EPRD offers postgraduate research and coursework degrees for those interested in reproductive sciences. The two main course streams offered are the Masters program in Clinical Embryology (MClinEmb, course code 2309) and also a Graduate Diploma in Reproductive Science (GradDipRepSc, course code 0101). We also support a research masters program in Reproductive Science (MRepSc, course code 0100) in conjunction with other stakeholders.